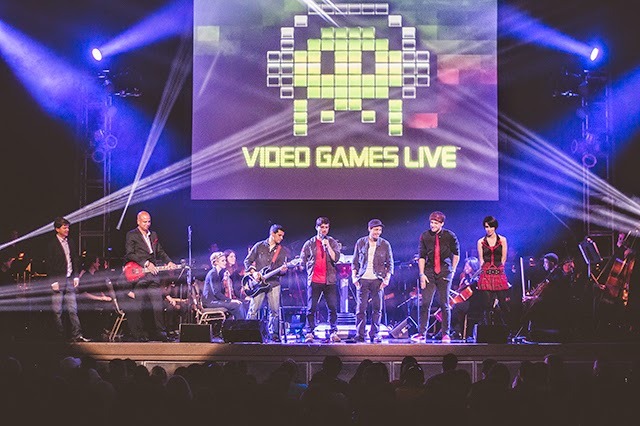 Through a series of circumstances that would take far too long to explain here, last Thursday, while on the road to Spectrum Live) we confirmed that we would be playing a series of shows with none other than Tommy Tallarico and his project: Video Games Live. I'll swap these with better photos once we get them. On the drive up to Orlando, our tour van had absolutely no problems. This is a first in our band’s history. I had brakes, I didn’t have to check the fluid levels for leaks, the heat gauge didn’t randomly spike, frogs didn’t appear while I was driving at high speeds, there were no hornet nests in the fuselage when I stopped for gas, the van started on the first try, and only three blinking indicators on the display console (which I’ve been told to ignore and have long since gotten use to) gently glowed while I drove the meet with the band in Orlando. I arrived at practice at 7:15pm, technically 15 minutes late but I had to pass some really bad traffic after a truck had somehow completely flipped on I-4, a technical feat I’m not sure I could replicate from the middle lane. Moose and I practiced together, because everyone else seemed to be stuck in the traffic until about 9:30pm (did I mention it was REALLY bad?). That was the first and only time as a full band we went through the song we’d be playing with the orchestra, Chrono Trigger/Cross, and the first time we’d played together in about two weeks. As we practiced, Moose accidently threw one his sticks, which I remarked would inevitably hit one of the orchestra performers, or worse, Tommy in the face should it happen at one of the shows we were about to play. We packed, drove back to Kit’s because we forgot to pack merch, and fell asleep at about 1am. Defying all modern stereotypes and expectations society places on rock bands, we woke up on Friday at 6:45am and were gone less than 15 minutes later. I drove us to a local gas station, because we were literally a mile or few from being truly empty, and a particularly irritating CVS attendant (located next to the gas station) prevented Rook from acquiring batteries until 7:15am. We got back on the open road, picked up our friend and photographer Jeff Douglas, and returned to the open road, passing a scene right out of a 90’s buddy-cop flick: a series of police cars that pulled over one depressed looking guy who was sitting on the hood of his car while it was searched. 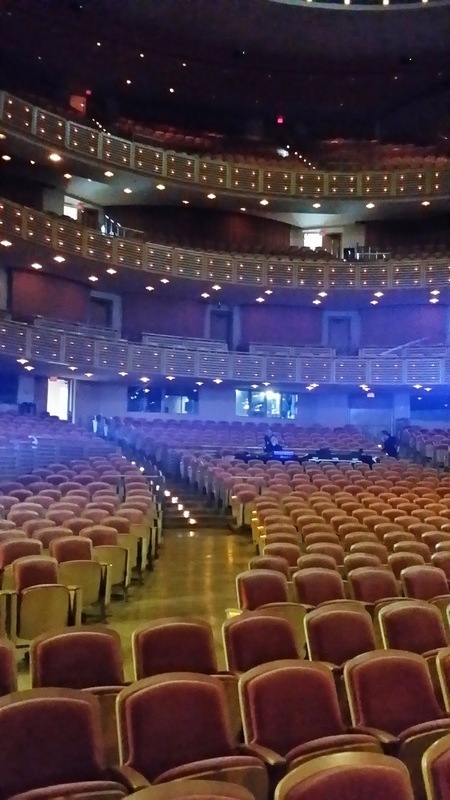 Nothing else eventful happened until we reached Miami, within sight of the colossal Adrienne Arsht Center. All of us were pretty dumbfounded looking at the amazing size and architecture because not only was it a pretty building to look at… but we would be performing inside of it… Having been inside the venue in the previous months I mentioned to the band that the stage itself is larger than most BUILDINGS we’ve performed inside of. This was both an amazing and terrifying prospect. We found our way to the security desk at the loading area and checked in. I really had to use the bathroom, so the security guard gave me special permission to do so before receiving my badge. I returned to the quizzical stare of building manager (I forget the proper title but this person controls the building, except for the actual stage itself and “backstage” areas), who wondered how I’d made it inside without meeting her and I explained my need to use the bathroom. The relevance here is that is sparked a 10 minute conversation where we talked about Distant Worlds, the Hyrule Symphony, and the fact that the manager was the first person on her block to beat the original Mario Bros. 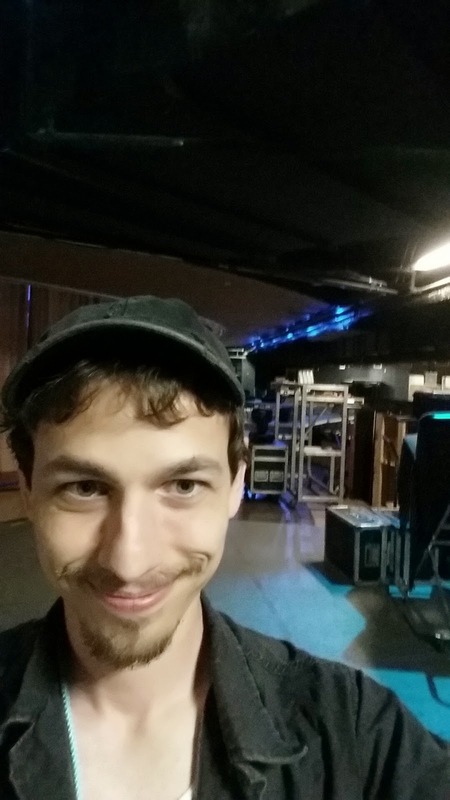 I was curious if any of the venue staff or musicians on the stage were gamers, or if they even had an appreciation for the video game music taking place within their halls and as I chatted with more and more people throughout the weekend it was clear that they genuinely had an appreciation, even if they didn’t consider themselves gamers. This isn’t meant to be a snooty elitist observation or anything, it’d be perfectly fine if they were just doing their job (and some were), it was just cool that the majority of the people I got to talk with were excited to be a part of VGL and were passionate about the music. By 11:30am we had unloaded and were in our green room, which, in a hall filled with signs like names, “Crew”, “Orchestra”, and “Choir”, was simply labeled “the Band,” which we liked. This was due to some confusion where the venue had only just learned specifically who we were on the morning of the show. The band green room boasted a television that showed a live feed of the stage (complete with the house mix), a shower, a vanity, a closet, and lots of open lounging space. I think one of us did an impersonation of the Sound of Music field/hills scene upon entry. 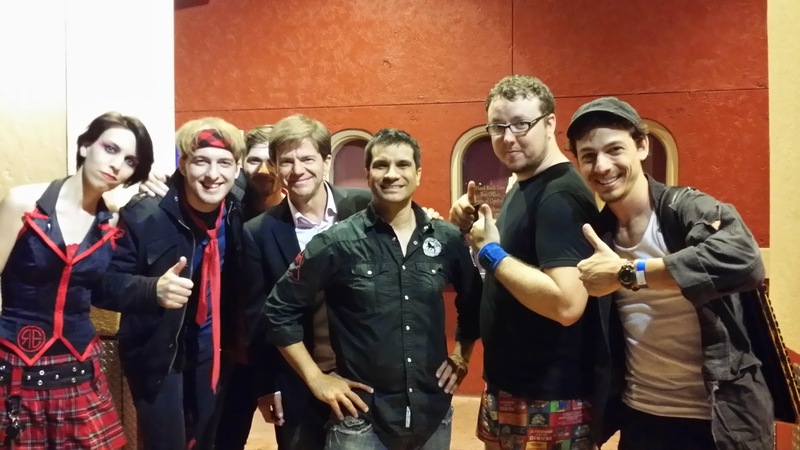 As we stood by the main widow of our room, I recognized Tommy Tallarico sporting a set of awesome red shows, and waved at him with Moose. 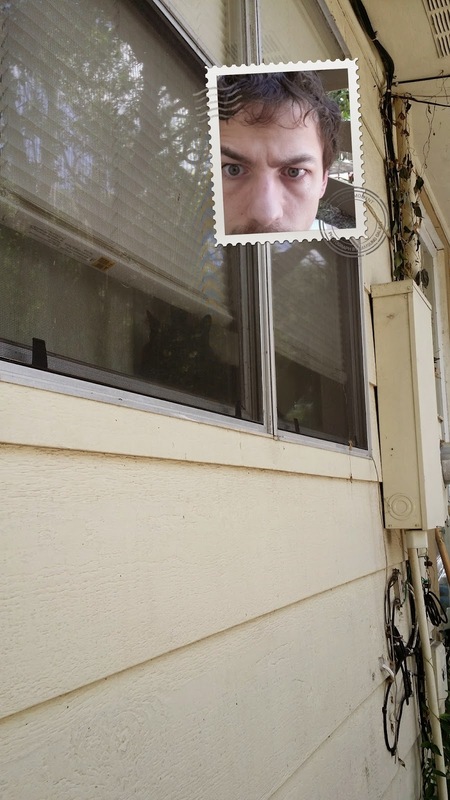 We thought the windows were tinted and didn’t expect him to actually see us. 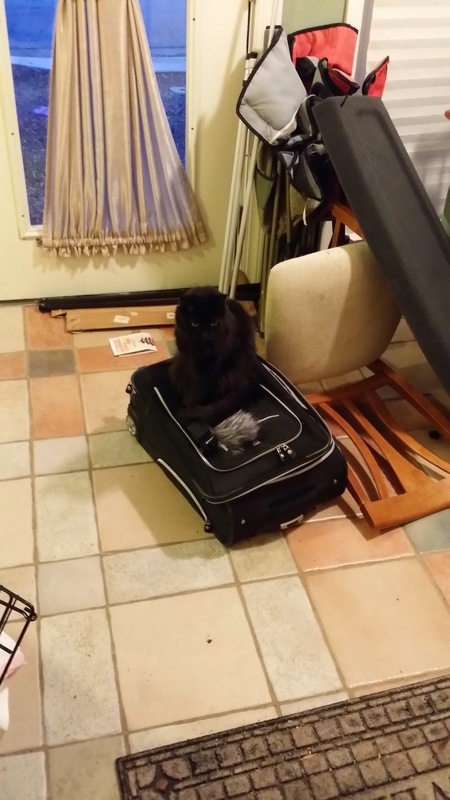 However, he could and motioned for us to unlock the door to let him in. Once inside we made semi-formal introductions and he chatted with the band for a few minutes. Tommy is a really friendly guy and even Kit, who though he’d be utterly intimidated by the rockstar/video game creator, soon felt at ease. 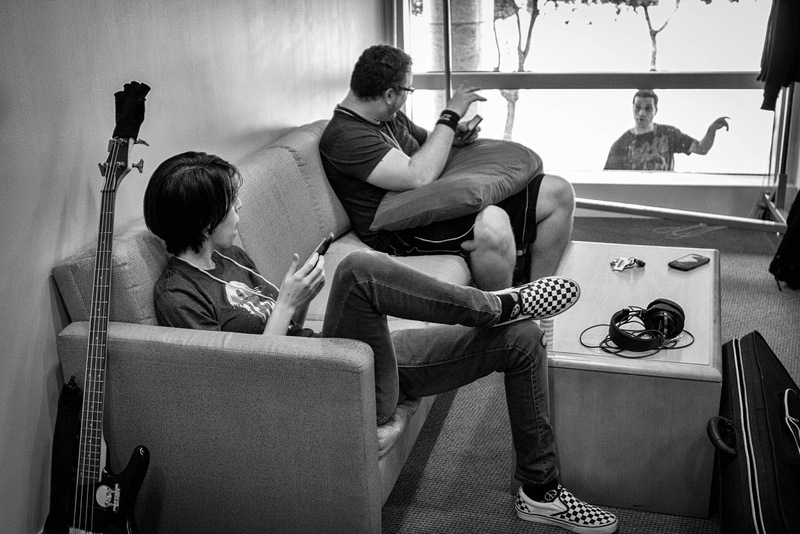 Tommy took really good care of us throughout the day (and greater weekend), checking up on us regularly, and making us feel at home within VGL. The only way to describe it is to say that we felt like long time acquaintances or friends of his that he was taking very special care of. He shared stories, like the time he exchanged guitar licks with Steve Vai, the last time he’d played an accordion, and he also introduced us to the VGL conductor, Emmanuel Fratianni, aka the friendly neighborhood writer of the soundtrack to the Amazing Spiderman! We took to the stage for our sound check, did that, and were told to return a few hours later for a rehearsal. 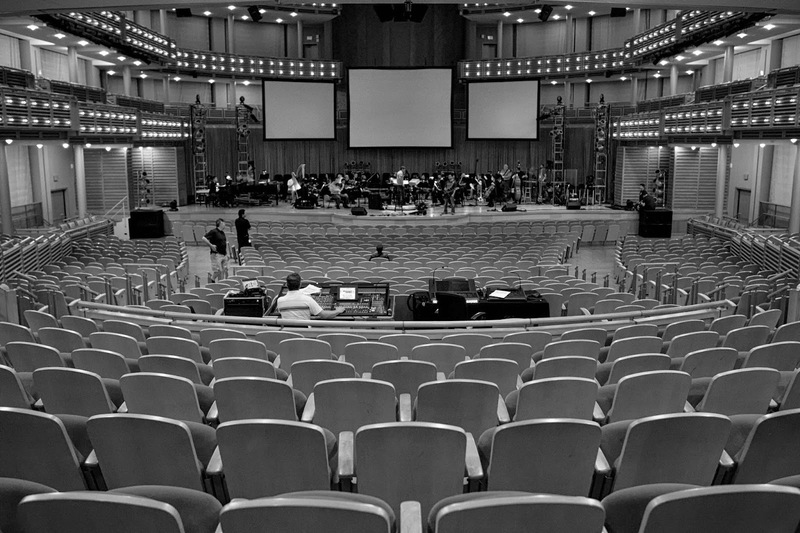 It was really incredibly to look off at the rows and rows of empty seats from the stage and think that people might actually be sitting in them when we performed. While the rest of the band went back to the green room to prepare/relax, I sat in the dead center of the audience to watch the orchestra/choir rehearse. It was an unforgettable experience… I was blown away as 60+ people masterfully played their instruments to an empty room, save for myself and the sound/lighting crew. I’m not sure if it was the performance, the songs (which have personal significance to me), or a mix of both but I found myself tearing up at many parts throughout the performance, and admittedly I actually moved to tears during Metal Gear and Sonic. It sounds cheesy, but I really was. There are very few times in my life I’ll get to experience such a thing and I was moved. At one point between songs Tommy pointed at me from the stage and asked if I’d seen the stage manager. I said no and was asked if I could play Guitar Hero… Being fairly awful at Guitar Hero I was a bit nervous when I said yes, and was told to come onto the stage and play while the orchestra played to my performance… I was also told that they were almost out of time and needed me to complete the level on my first try. No pressure, right? As I took picked up the controller I could hear whispers amongst the smiling orchestra members saying things like “that’s the accordion player, right?” as I fumbled for a good 20 seconds trying to find the start button. 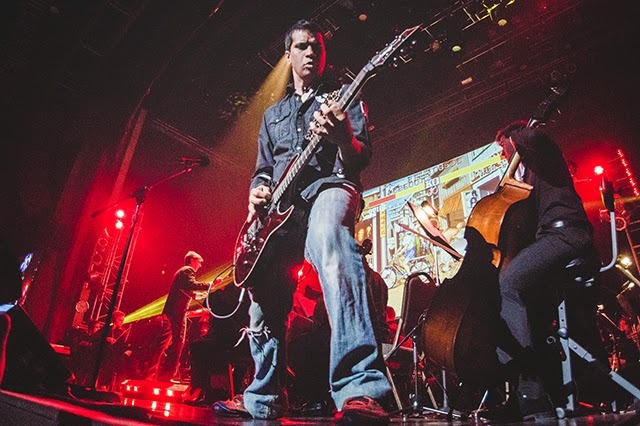 All in all, I got through a song in Guitar Hero while the Video Games Live orchestra played along with me, another experience I’ll never forget. I sat in the audience for almost the entire set after that, though I had to leave to make sure all merch and show preparations were made. 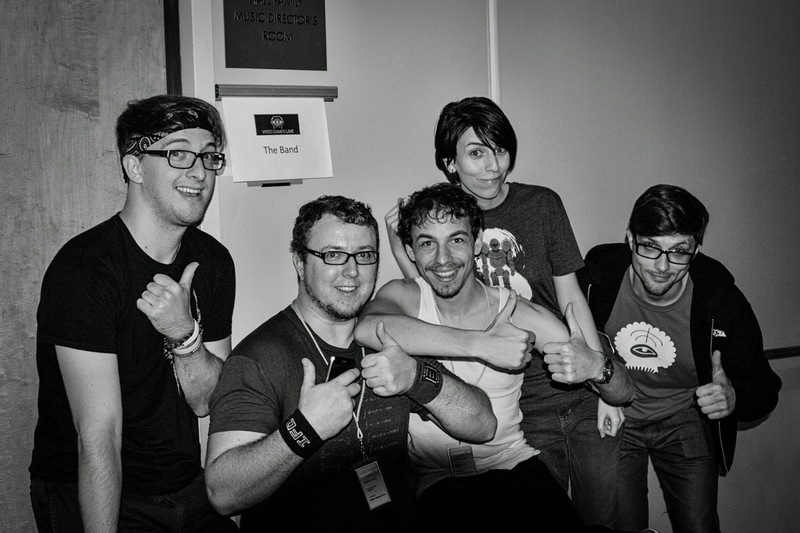 The stage/tour manager and crew with VGL are also pretty cool folks, and it was during this portion of each day that we got to chat with them. During dinner I decided to sit in the cafeteria, because I’m a messy eater, and met the harp player, the French horn player, and Craig Turley of the Craig Turley Orchestra, the VGL orchestra for two of the FL tour dates. 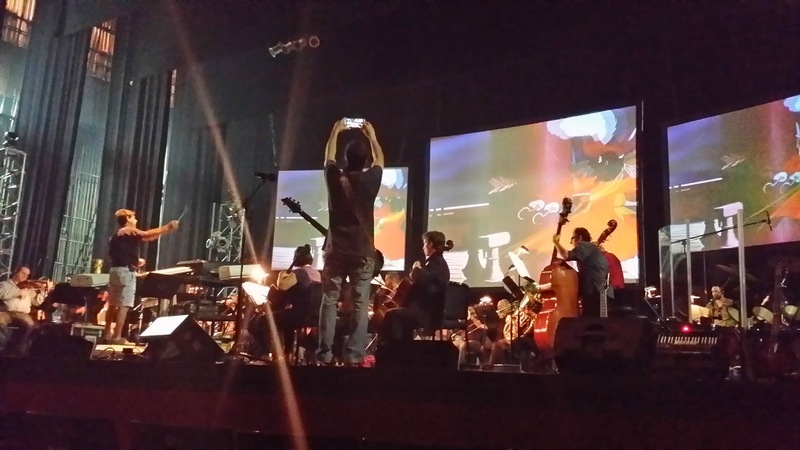 You see, it’s not always the same orchestra every time you see VGL or Distant Worlds… They don’t necessarily tour with an orchestra, the production performs with a local orchestra. Mr. Turney, who I’d met by asking if he was in the orchestra, was kind enough to explain the finer points about how orchestras work. We also chatted about the sorts of shows they’ve recently played and he introduced me to Louis, the lead violinist I’d talked about at Distant Worlds. Louis was also really fun to talk with as well. It was about this time I also learned that the VGL choir was a local highschool choir. They sounded like seasoned professionals and this came as a surprise to me and the rest of the band. After what felt like a really long (but enjoyable) time, the band and I found ourselves on the side of the stage, watching the start of the show. The winner of the pre-show costume contest was an impressive female Solid Snake. As we congratulated her, she asked for some help in opening a small plastic container. I volunteered and it wasn’t until I’d opened it, spilling its contents slightly all over my fingers that I realized (to my complete horror) that it was crazy glue… My hands, specifically my fingers, were covered in crazy glue mere minutes before we were supposed to perform… I couldn’t feel my fingertips, which are really important to pushing 1 of the 120 buttons on my accordion and I spent the next 5 minutes scraping the glue off my fingers using a brick wall, my teeth, and my nails. That was the extent of my panic, though. Once I could feel my fingers again my only concerns about the show were in making sure I was having a good time… Okay, that’s a bit of a lie. I’ll admit that I was fairly nervous about this show, probably the largest performance of my life, and making sure I sounded alright. As Tommy introduced the next song and got off the stage, he looked at us jokingly from backstage and said aloud “at least I think that’s the song they’re playing…”. 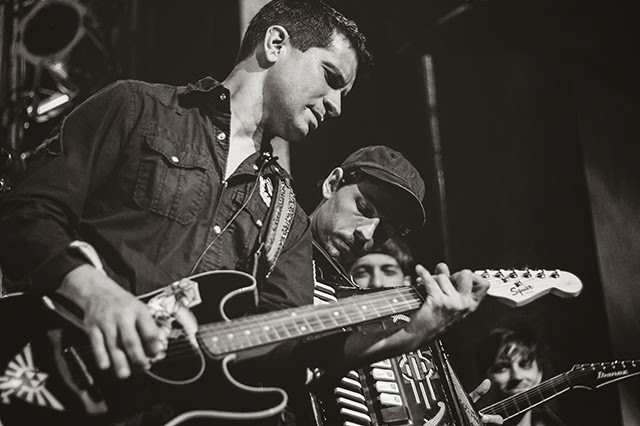 His ability to be at ease had a similar effect on us and after what seemed like an eternity (it was an awesome show, we were still just a bit nervous) we were called onto the stage to play our Zelda set, essentially the songs I’d been playing since I first started playing the accordion. By the second song in our medley I was pretty comfortable with the crowd. No, I didn’t ignore them, or imagine that they simply weren’t there. That doesn’t really have a place in an “interactive” show. I didn’t imagine them naked or as stuffed animals like my childhood television shows would have me do (I lack a visual imagination). I just focused on having a good time and everything else seemed to fall into place. It was pretty magical and over faster than I could have imagined. Emmanuel and Tommy gave us high fives as we departed the stage and shortly after the thrill wore off, the band did our traditional post-performance self-critiques of things that no one besides us would notice. 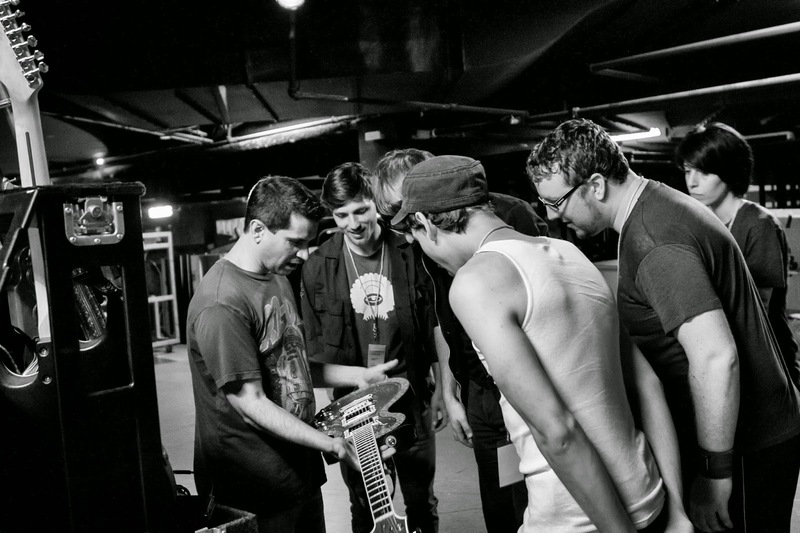 We watched the rest of the set from the wings while I silently pondered why we didn’t do things like this more often. At one point, during the intermission, the fire alarm was set off and I spent awhile with members of the orchestra, pondering calmly if we would grab our gear and run if we saw fire, or if we’d just wait it out. The woman with the Cello made from 400 year old wood didn’t take any risks, and awhile later it turned out to be a false alarm. 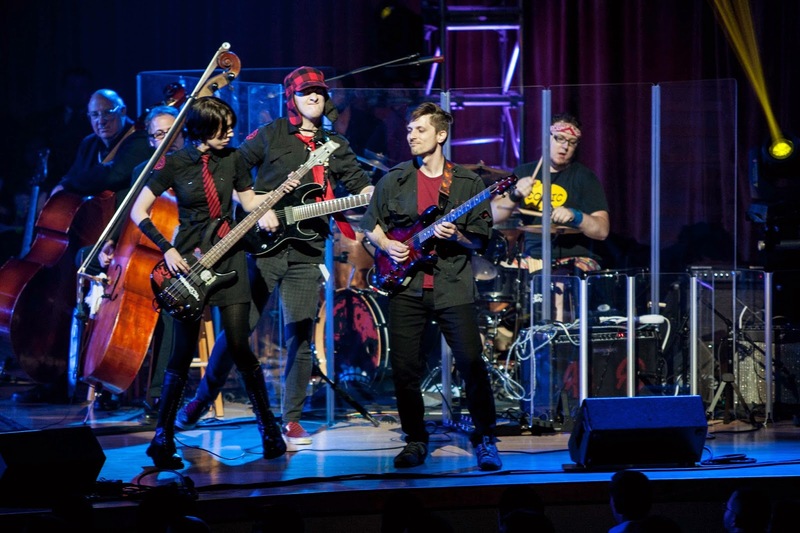 The second half of the show continued, we played another piece, the show ended, and during a Chrono Trigger/Cross Encore my band got to join the orchestra for one of the coolest performances I’ve been a part of. 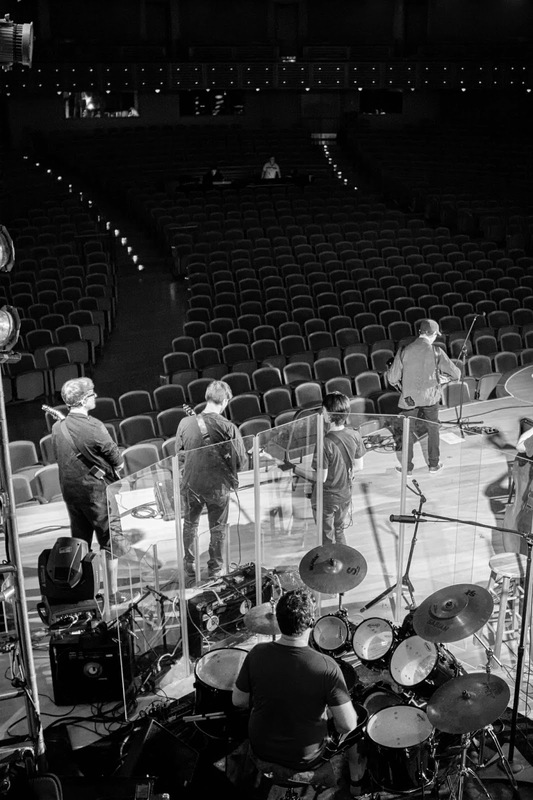 It was pretty awesome getting to actually perform WITH the orchestra and the bandmates could barely contain our laughter when Moose accidentally pulled out his headset on the first hit of the song. All in all we did alright and made it to the end of the song in good time. After that, Tommy, the band, and I led and the audience in a sing-along version of Still Alive. In addition to being a mind-numbingly awesome experience in and of itself, this moment had a very special significance to me. Some years ago, while my band of the same name was splitting up, our bass player at the time (not Rook) told me that Random Encounter was talentless, hopeless, that we would never amount to anything, that I personally would never amount to anything after the band broke up, and that I would never perform Still Alive in front of people again. As I looked out into a sea of cell phones (the modern lighter at rock shows), 3DS’s, and PSP’s I felt pretty good about myself. Awhile later we drove to the home of two of our super-fans, who happen to be married to each other, and enjoyed their great hospitality (and home cooked breakfast!!!) in the city of Davie, FL… Which we discovered the next morning seems to be stuck in the 80’s because while we drove by Davie Dr. in Davie, FL we witnessed no less than 5 separate people all sporting clothing and haircuts clearly indicative of an 80’s adventure film. 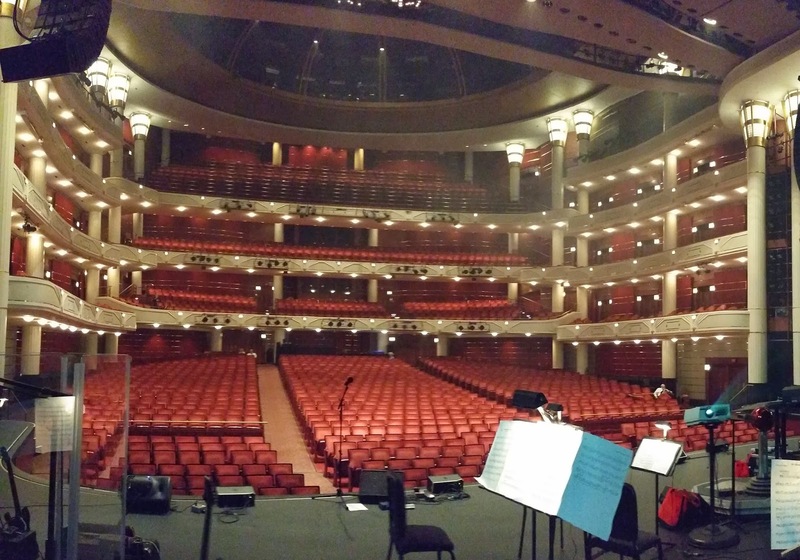 We arrived at the next venue, the Kravis Center in West Palm beach, by 1pm the following day, did our sound check, and started to understand the routine of VGL a bit more. Better yet, we seemed to be acclimating to it. Moose played Rock Band this time (getting a 99% success rate, only missing the last note), and we chatted with elements of the Santaluces Choir after the rehearsal. They were sort of quiet and reclusive at first, but after we offered them all free CD’s (because they are some seriously talented kids we are honored to have performed with) all thoughts of us as being an unapproachable and reclusive band were obliterated. Those kids are definitely going places in life. 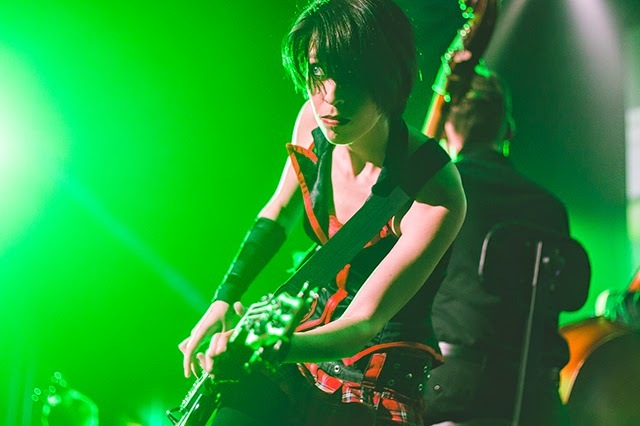 The second performance night was similar to the first, though the entire band seemed to be in agreement that there was significantly less stage fright this time around. It was no more terrifying than a smaller performance in front of our friends and our only fears revolved around falling out of time with the rest of the orchestra, which didn’t happen either night. We played, we watched, we cleared off the stage, we meet and greeted, we drove to Orlando, and passed out at Moose’s home. Our homecoming show, the Hard Rock Live in Orlando, was a bit different. The composer to the God of War series was present and involved in the show, rocking two conducting sticks (similarly to how Kratos wields two swords), we were performing with a new orchestra/choir, and many of our fans were at this show. It was pretty awesome getting to share the full VGL experience with our extended band-family and friends and it was also pretty awesome to meet the hundreds of people who’ never heard of us before who were from our hometown. The whole experience with Video Games Live was pretty magical. It arguably changed my life, shifted my focus, and I hope that those who read this will understand the sincerity in these words. Awhile ago I’d lost sight of what was important to me and nearly gave up. Now and for the rest of my life I’ll have the memories of this weekend to remind and inspire me when I’m in such a lull. To each and every person who made this possible, to each and every person who came out to show your support, and to each and every person who showed up to have fun: Thank you for an unforgettable experience. Ayee dude! Are you looking for new Minecraft server that you can play to receive money? Checkout play. universemc. us. You can play the server to get upto $1, 000 $ just for being the best player on the network! The network involves Factions, Prison, Skyblock, Kitmap and many more gamemodes! It includes big youtubers engaging in on the network!